A dog bite can be not just terrifying, but devastating. Your dog bite injury can permanently damage the nerves and tissue in the area of your body where you are bitten and in some cases, permanently reduce your capacity to earn a living. It can also saddle you with large medical bills and leave you suffering from anxiety related to the emotional trauma for months or even years after the bite. Any dog can bite a victim. Even the most docile, friendly dogs can bite when they are frightened, provoked, or suffering from a health condition like rabies. If you are bitten by a dog, clean and cover the wound as soon as possible, then seek appropriate medical care when you can. These injuries can have complications and put you at risk for other conditions, such as a cut becoming infected. A dog’s bite transfers pathogens from the dog’s mouth to your body, which is why it is critical that you treat the bite with antibiotic ointment after cleaning it thoroughly. In Michigan, a dog bite victim can recover compensation for his or her dog bite damages regardless of whether the dog’s owner previously knew about the dog’s propensity to bite. 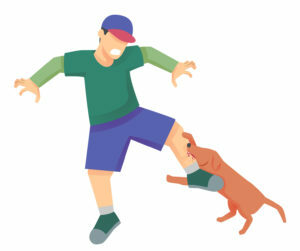 Any time a bite occurs when the victim is on public property or lawfully on private property, the dog’s owner is liable for the victim’s damages. The only exception to this liability is when the dog’s owner can prove that the victim provoked the dog into attacking. With other types of dog attack-related injury, the victim must prove that the dog’s owner was negligent in some way, such as failing to secure the dog with a fence or a leash. If the dog’s owner caused the attack, which can occur when an owner orders his or her dog to attack or purposely creates a situation in which a dog bite is likely to occur, you may also recover punitive damages. In order to do so, you must successfully demonstrate that the dog’s owner intentionally caused the bite to occur. If you are suffering from high medical bills and other financial damages after being bitten by a dog, you have the right to pursue compensation for your damages with the help of an experienced personal injury lawyer. Do not wait to file your claim. In Michigan, the statute of limitations for personal injury lawsuits is three years from the date of the injury. Be proactive and schedule your legal consultation with Nickola Law today.